As their empire faces crushing defeat, the Ronnesian mages are forced to make an impossible choice. Three years since the last of the twelve legendary mages were revealed, the politics of war have shifted. Determined to try for unity, King Samian reaches out to the Ronnesians with an offer of marriage, a bloodless end to the war and a vision for a peaceful future. Yet Queen Sorcha is wary of deception. While politics governs the leaders, others are moving in secret to deal the Ayons a fatal blow, in the hope of tipping the balance permanently in the Ronnesians’ favor. But instead of faltering, the Ayons swiftly retaliate and the first wave comes crashing down. As the northern defences strain and begin to buckle under the force of the crimson army, the Ronnesian mages are forced to break the unwritten rule to save their empire from destruction. 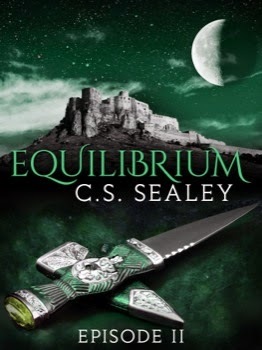 Episode 2 is (of course) the second of six episodes in CS Sealey's serialized novel Equilibrium. The scope grows and the stakes rise. I have to say Sealey's writing is a real treat. Her prose is strong and clean while remaining both easy to understand and vivid. I feel like I don't have to work to keep up yet she keeps the pages turning and the action intense. Whether a battle or a simple argument, conflicts are clear and balanced without leaving me feeling shortchanged on anything. I'm also intrigued by the mercenary/assassin, Sable. We first meet him in Episode 1 and in this episode his part in the plot brings him closer to the primary characters. I have all sorts of ideas how he might fit in and look forward to seeing if any of them are correct. Looking forward to more magic and mayhem. Equilibrium continues to be a very enjoyable read.